Our Client Base is Built On Trust and Personal Referrals! We are available to serve people in all types of personal injury and wrongful death cases, including those related to car accidents, slip and fall, and worker's compensation. We represent people in our home city of Charlotte, North Carolina and throughout the Charlotte area. We are reliable professionals serving your community since 1995. We listen to you and work to get the best possible results in your case. When you choose our law firm, you will get the level of representation you deserve. Your case will not be passed to a secretary or an investigator. Lead attorney, Cynthia Justice, works on every case. 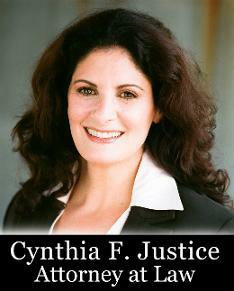 Cynthia Justice cares about our clients. Cynthia has been in practice in Charlotte for over 18 years, representing clients, their children and family members. Her clients know that she is there for them when they need her. She is here to listen to your concerns and fight for your rights. Put Justice On Your Side Today! Call our office at 704.342.4434 or fill out form to schedule a free initial consultation with Attorney Cynthia Justice. Attorney Justice knows that your time is important. She will consult with you answering your questions and concerns at your convenience, over the telephone or at your location.